It appears Texas Tech will be well represented in the stands during the Final Four on Saturday at U.S. Bank Stadium in Minneapolis.. According to StubHub, its sales from last year are up more than 10% compared to last year tickets for the Final Four games have been bought from 49 states. The most popular buyer is from, not surprisingly, Minnesota, buying 24% of the tickets sold. Next among the list is Texas, representing 15% of the buyers. It is a long trip for Texans, but this is the first time in school history that Texas Tech is in the Final Four and fans clearly are taking advantage of a chance to see the Red Raiders make history. 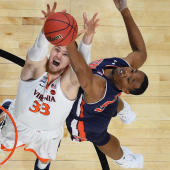 "With two of the four schools making their first ever appearance in the Final Four, we are seeing increased ticket demand from excited fans," said Jill Krimmel, General Manager of NCAA for StubHub. "After such an exciting March, fans are ready for anything to happen and are proving that they're willing to travel to see their team make history." Texas Tech's opponent, Michigan State, is right behind him. The state of Michigan has accounted for 8% of the tickets sold. The Virginia vs. Auburn matchup will have less fans from those states. Virginia currently makes up 6% of the fans who have bought tickets for the game, the fourth highest selling state. Alabama, where Auburn is located, is currently the No. 7 selling state with 4% of total ticket sales. So unless there is a late surge in them buying, The Tigers may not be the most popular team at the arena. The get-in price to get into the stadium was sitting at $299 per ticket on Thursday, according to StubHub.